A neighbour kindly gave me a leg of young wild boar recently. I find the traditional method of cooking boar here (marinating for 2-3 days in robust red wine and herbs, then braising) nauseating and indigestible. But this tender joint responded well to my adaptation of a Delia recipe for braised leg of lamb. In fact if you can’t get boar, you could substitute lamb (leg or shoulder) here. Serves 4-6 — this is almost a one-pot meal, although I served it with a little pasta to soak up the sauce. Rub the meat with salt and pepper and put it in a non-reactive container such as a glass bowl. Roughly crush the whole spices in a pestle and mortar or with a rolling pin — no need to turn them to powder, just break them up a bit to release the aromas. Add to the bowl with the bay leaf and herbs. Pour over the red wine, cover with clingfilm, and refrigerate overnight, turning occasionally if the marinade doesn’t completely cover the meat. The next day, preheat the oven to 200C. Pour 2-3 tbs of olive oil into a heavy roasting tin and put it into the oven to pre-heat. 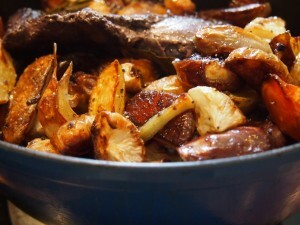 Clean and trim the vegetables; cut the turnips into quarters and the potatoes into wedges. If the carrots are very small, leave them whole — otherwise, cut them into chunks. Peel the shallots. Tip all the vegetables and the garlic cloves into the roasting tin, turn them in the oil, and roast for about 25 minutes, turning them once to make sure they don’t stick. Meanwhile, remove the meat from the marinade, dry it, and put it in another roasting tin. Rub all over with olive oil and season with salt and pepper. Put the tin in the oven and roast for about 30 minutes to colour it nicely. After this, reduce the oven to 170C. If the tin with the meat in it is big enough to hold all the ingredients including the marinade, you can continue to cook in this; at this point I transferred the meat and vegetables to a large enamelled cast-iron casserole. Pour over the reserved marinade and bring to the boil on top of the stove. Add some fresh thyme and/or rosemary sprigs. Cover tightly with a lid or a tent of foil, return to the oven, and cook for a further 1-1 1/2 hours. At this point you can set the dish aside for later reheating. About half an hour before you want to serve it, remove the meat and vegetables and bring the sauce to a boil on top of the stove to reduce it slightly. Taste and adjust seasoning as necessary. Then return meat and vegetables to the pan to heat through, carve the meat, and serve with pasta. You can also butterfly a young wild boar leg like lamb and cook it on the BBQ. Delicious!